The Acts 4:32 share group on Facebook is one of the simplest and most effective ways that the Grace Klein Community is able to see God work in immediate tangible ways right here in Birmingham, AL. The group is designed to be interconnected with a constant movement of giving and taking. If you know someone in the group, they can invite you in, and once you are in you can also invite anyone you know. Then the people you invite can invite anyone they know and it keeps scattering and growing in a beautifully intertwined and relational way. A fun fact is many people have shared that when they are having a bad day, they go to Acts 4:32 to read what God is doing. Two years back, we kept seeing a new community member engage in the Acts 4:32 group. She was willing to share everything and from her generosity she was building a natural momentum of love and kindness in the group. We all began to feel like we KNEW Angela Warren, even though many of us had never met her. Eventually, during our 2017 Drum Circle, Angela came and introduced herself. When she said her name the excitement was instant. Here she was this mystery woman that was making so much impact in Grace Klein Community. AND she walked up so confident, as if we had known one another a lifetime of years. She went straight in to how this or that situation could be addressed and what she would bring by next. Wow, a real living and breathing representation of an open handed life. Grace Klein Community, Inc. struck oil when our paths somehow intersected with Angela. 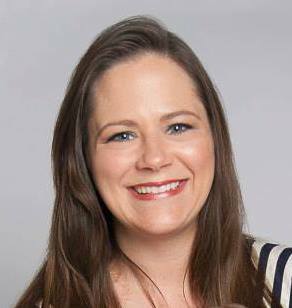 Today, she is a lead volunteer and serves in a variety of unique and intentional ways. Angela retrieves rescued food from one of our weekly donors, involves her bunco group in special projects, teaches us new ideas and how to implement those ideas to improve the organization, delivers food to groups and individuals who need encouragement, continues to meet immediate needs from the Acts 4:32 group, and stores overage food in her freezer for food delivery. Of course that is not all she does, but a good perspective of all the ways she shares her life with us. Angela and her husband have two precious daughters that serve alongside her. 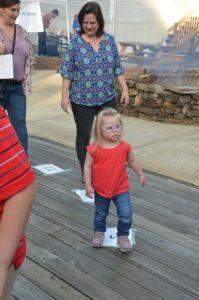 Many mamas bring their children with them, which is a delight of Grace Klein Community, but even more amazing is one of Angela’s daughters has Down Syndrome. 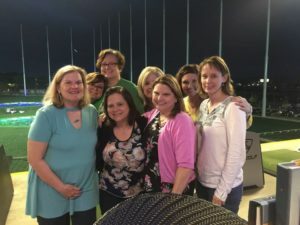 A diagnosis does not stop Angela and her girls from scurrying around town, while her husband works, and spreading joy and laughter and hope to all they meet. Watching those young ladies share a hug or deliver some treats to a new friend is an inspiration. Angela is teaching and giving the girls a life full of adventure as she teaches them creativity, the courage to try new things, and the importance of kindness. In today’s world, we often need shirts that say, “Be Kind!” Maybe the stress of fractured relationships, the anxiety of bills that need paid, or even the constant busy and hurry of our lives is making many of us not so kind. If Angela’s girls know that Down Syndrome is challenging, she is teaching them daily that it has no power to box them in, discourage them, limit their opportunities or isolate them from the world. Angela’s circumstances do not define her attitude, her response or her emotions. She is walking kindness and she is making us all better. If you see a beautiful woman, that always has a smile on her face and a kind word, hauling a hair dryer, a box of frozen bread or a platter of goodies, you may have passed Angela. She is on the move to share love with every person she meets.